Pioneers in the industry, we offer horizontal inclined modular belt conveyor from India. We are well known industry in the market as the foremost manufacturer and supplier of Inclined Modular Belt Conveyor. The offered Inclined Modular Belt Conveyor is precisely designed by using high grade components and ultra-modern technology in adherence with industry standards. Furthermore, this belt conveyor is available in varied designs and specifications to cater the demands of our clients. 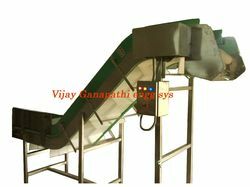 Our provided belt conveyor is highly acknowledged in the market for its various quality attributes. Looking for Inclined Modular Belt Conveyor ?